Edward Tufte says maps are metaphors. I’m no infometrics whiz, but i like this idea – if, for no other reason, than my affinity for maps. Splayed across my wall before me is a map of Edinburgh i peeled out of my guidebook. Adjacent to it is a map of Durham, North Carolina that i plucked from a visitor’s desk downtown. Though these maps are from far-away places, the greens couldn’t be of a more identical hue. I love this metaphor within a metaphor: a town that is known to me and a town that is new are not so very different that they are required to clash. Durham’s streets are reminders of the world that has nurtured me, and Edinburgh’s closes and squares nurtures the at-times-overwhelming feeling of falling in love with a new world. Yet falling in love with a new place means i need to share this love with the people who make up the home in the map of my heart. I sometimes fear my noticing of the very-matched greens will be a noticing only for me. That while this world i’m coming to know in Edinburgh is vast and exciting and beautiful, it starts to make my own dot on the globe all the farther from the world i knew. 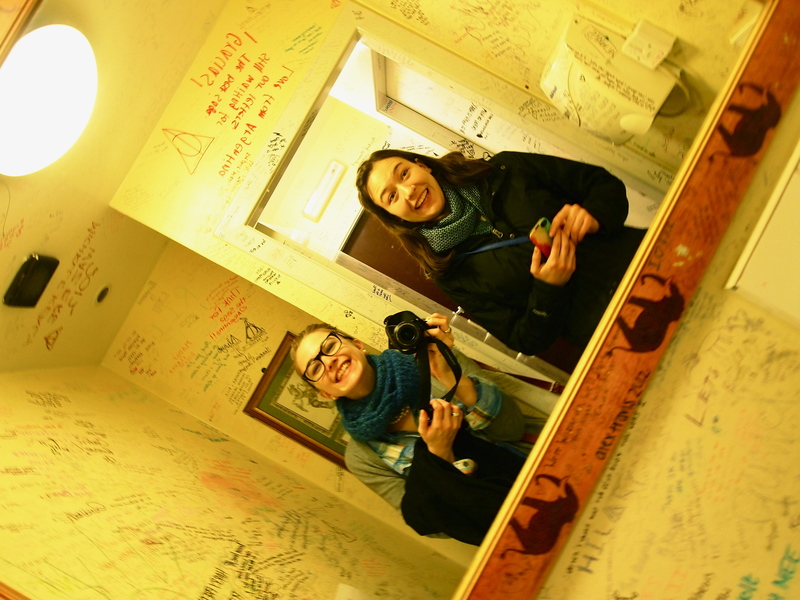 This fear, though, was deeply assuaged this past weekend: i had the delight of sharing my budding romance with Edinburgh with one of my dearest, dearest friends – Nora! As she is also studying abroad in the UK, Nora and i threw together a weekend excursion about the city on a whim – a marvelous, serendipitous, and delicious whim. Because i’ve been so focused on making myself feel at home in Edinburgh, i haven’t necessarily done all the typical tourist-y things one might explore on holiday. Having a guest, though, was the perfect excuse to give myself full permission to go light on the schoolwork and heavy on learning all the reasons you should holiday in Edinburgh. Our gastronomical tour began with the comfort food haven, Mums. “Top nosh at half the cost,” according to the website, Mums boasts of a vibrant and edgy charm: they’re home-cooked comfort mixed with urban attitude. I mean, the mac & cheese has a spice kick to it and comes with chips! * Who doesn’t love drowning in cheese and carbs? Their food is locally sourced, their service impeccable, and the deal incomparable to anywhere else. Eating there with Nora was my first time, but it will so most definitely not be my last. Having sated our need for traditional fare, the next evening’s meal was one reminiscent of home: Southwestern American cuisine. Living in North Carolina for so long spoiled me, with taco stands and sit-down Mexican restaurants on every block. So to tend to my poor, burrito-deprived needs, we ventured to the local Tex-Mex joint: Illegal Jack’s. It was all i wanted and more, guacamole included. 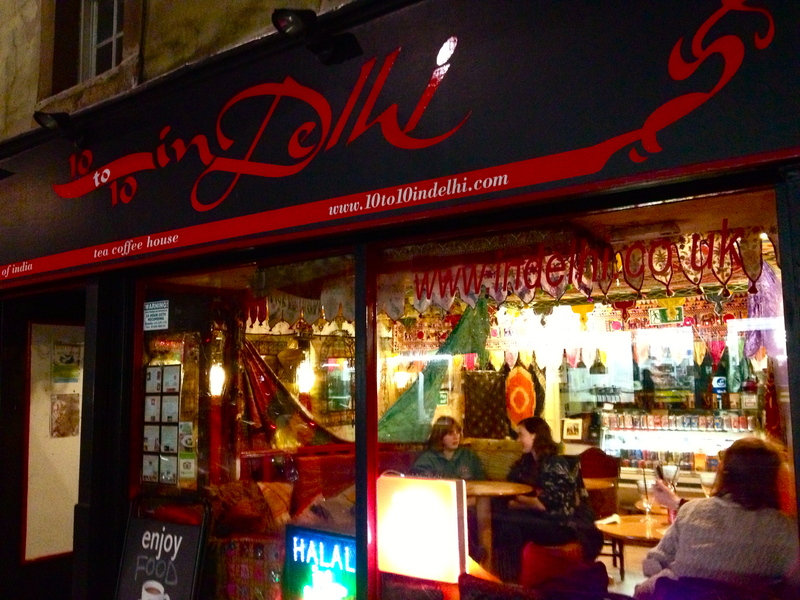 Our final dinner was at a place i’ve frequented before: 10 to 10 In Delhi, a Halal Indian restaurant with excellent chicken roti and even better student deals. If you’re looking to stretch your pounds, three quid will get you a belly-stretching meal here. We particularly loved the pretty tapestries stretched across the ceiling and the cozy couches! 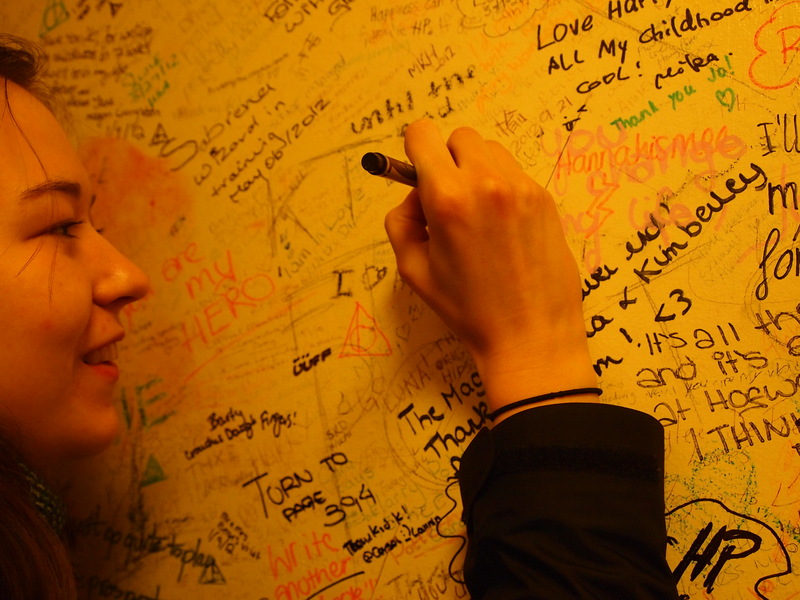 Easily the best place we visited, though, was no foreigner to me: The Elephant House Café. 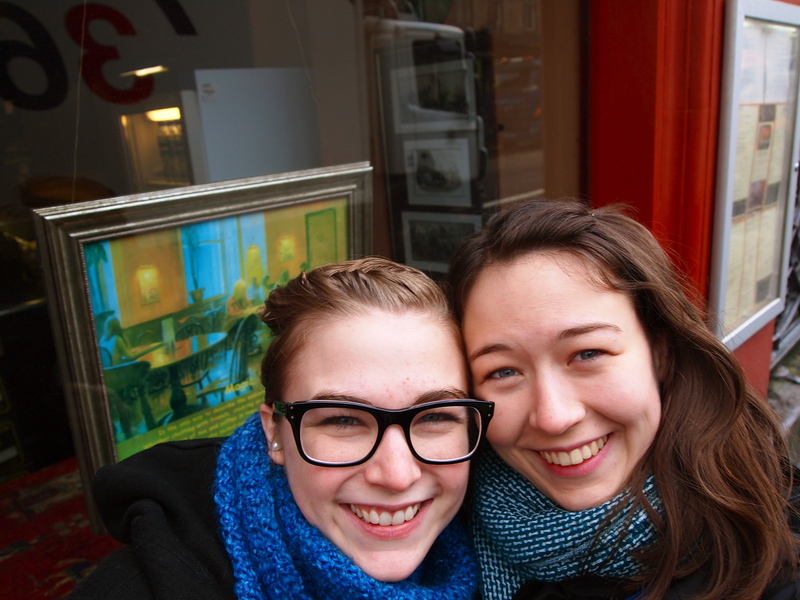 I met Nora in the fall of our first year at Mount Holyoke. She was wearing a Hogwarts crest t-shirt, it was love at first sight, and the rest (as they say) was Hogwarts, A History. Nora and i are no strangers to Harry Potter-themed adventures; in the winter of the subsequent year, we attended the Brooklyn Yule Ball together. On the last day of finals. In Christmas-themed ball gowns. We’d skipped dinner in an effort to catch the last train into the city, downing rolls of bread and Dr. Pepper’s in a convenience store outside the venue as substitutes. There aren’t many people you can romp about New York City in a gold petticoat with, but Nora has always been an exceptionally genuine and beautifully adventurous friend. I remember gleefully turning to her, as Harry and the Potters crashed and roared over their keyboard and guitar on stage. “I’m so tired, but i am having so much fun!“she mouthed over the din. It was a magical moment to share with a dear friend then, and it was just as magical to share the “Birthplace of Harry Potter” with her this weekend over elephant-shaped shortbread and excellent cups of tea. 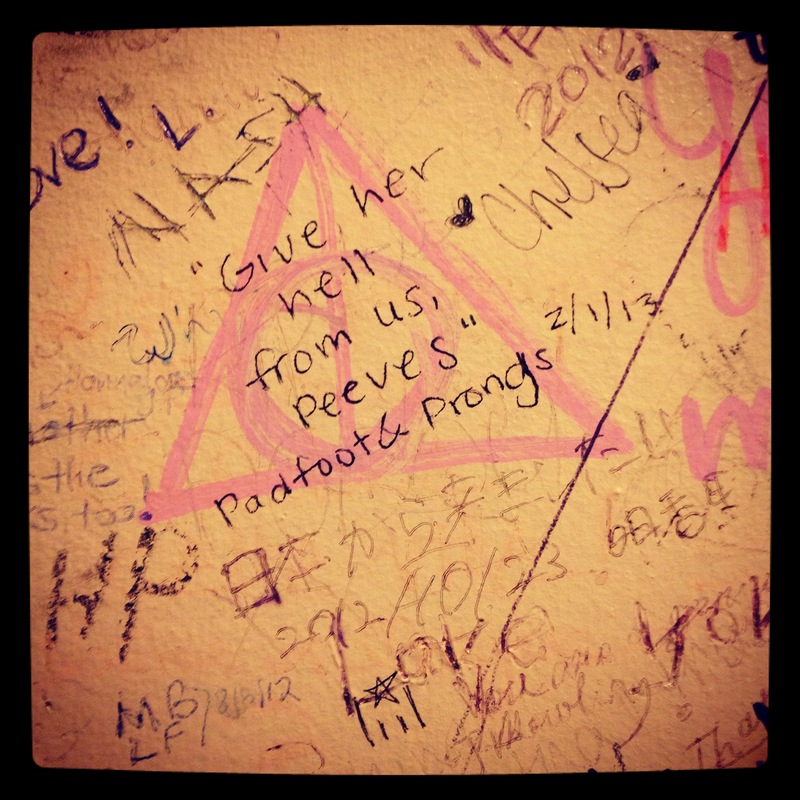 We were sure to leave our own note in the bathroom – signed, as ever, with our nicknames for each other: Padfoot & Prongs. Feeling known is an immense gift. I feel known by this city – but part of this feeling known comes from sharing it with an old friend. Nora and i have a history of adventures (gastronomical and literary alike!) and to make this weekend a part of that map of stories was such a treasure. My green maps still match, and the loves in my life make the most beautiful harmonies when sung together. current jam: ‘good morning sunshine’ alex day. best thing: a beautiful place to be with friends. p.s. you can always find my reviews of restaurants and attractions on my tripadvisor profile! *for friends in the states: chips = french fries, just in case your daily dose of the BBC hadn’t kept you abreast of British slang!